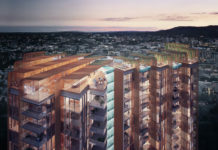 An updated development application has been submitted for the California Lane proposal in the Fortitude Valley. 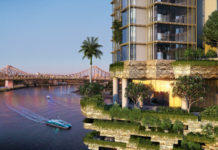 Proposed by AMC Developments and headed by Charlie Apostolos who was the former president of the Fortitude Valley Chamber of Commerce (FVCC), the proposal has undergone minor changes while also seeking an extension to the original development application. 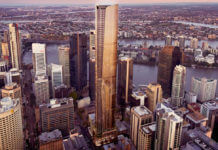 According to planning documents, the design had required additional amendments which has postponed construction of the development. AMC Developments have previously been responsible for the redevelopment of Bakery Lane. Designed by Guymer Bailey Architects, the newly revised development application for California Lane complies with these conditions while also now baring a distinctly Californian architectural flavour, unlike it’s original design. 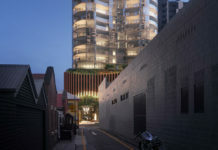 Meanwhile a new development application (A004678790) has been submitted for nearby Warner Lane which proposes to activate the space through a new restaurant and bar which would be located at 702 Ann Street, Fortitude Valley. Access to the new restaurant and bar will be via the laneway. 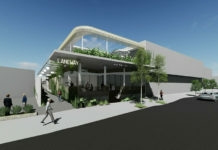 California Lane and Warner Lane will be the third and fourth privately funded laneway redevelopment to occur in the Valley following the development of Wynn and Bakery Lanes. The last remaining Laneway in this immediate area of the Valley which has yet to be redeveloped is Lucky’s Lane, the key connecting lane that links together the small laneway network. The DA number for California Lane development is A004713610.